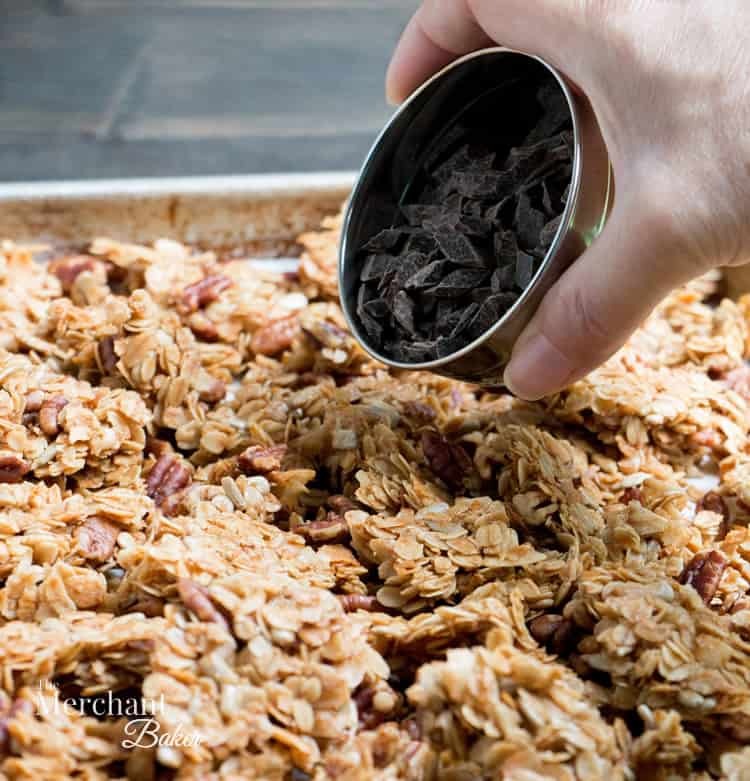 If you’ve never made granola, let this Chocolate Chunk Pecan Granola be your maiden voyage. 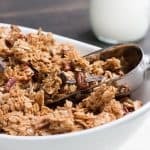 How do you make granola? 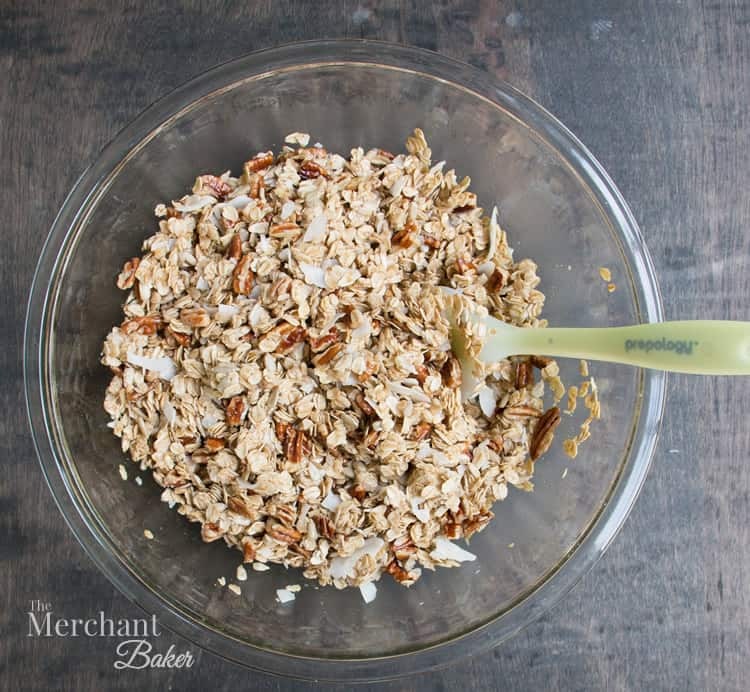 It’s really as easy as mixing up a bunch of favorite things, pressing the mixture into a pan and baking it! 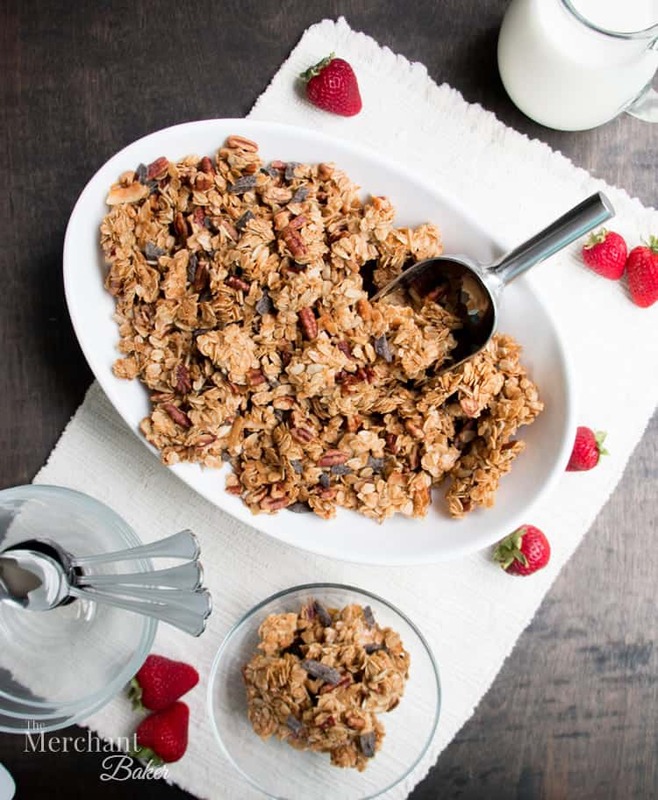 Let’s take a vote…raise your hand if you love granola. What’s not to like? 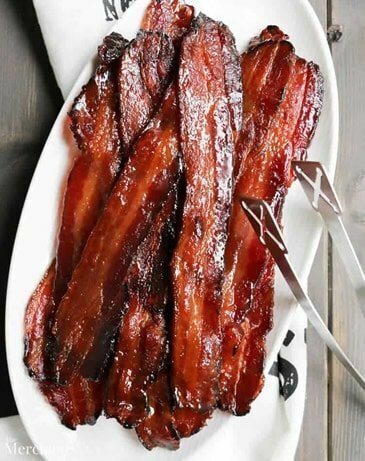 It’s hearty and crunchy and sweet and kind of addictive, isn’t it? C’mon…you know me by now. “Chocolate Chunk Pecan” pretty much nails one of my favorite chocolate chip cookies. Cookie motivation aside, the bag of granola had less than the average amount of sugar you would normally see in a store bought variety, so I scooped it up along with some fresh fruit and a large container of Greek yogurt. 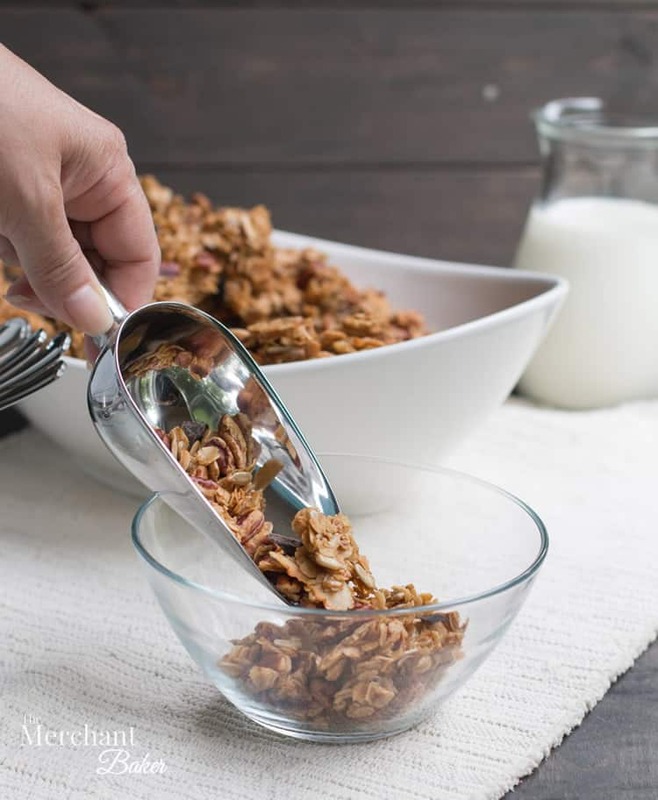 We had been tapping the whole granola/yogurt parfait thing pretty frequently for breakfast that year. It’s a nice change of pace, and it’s just so easy to put together. 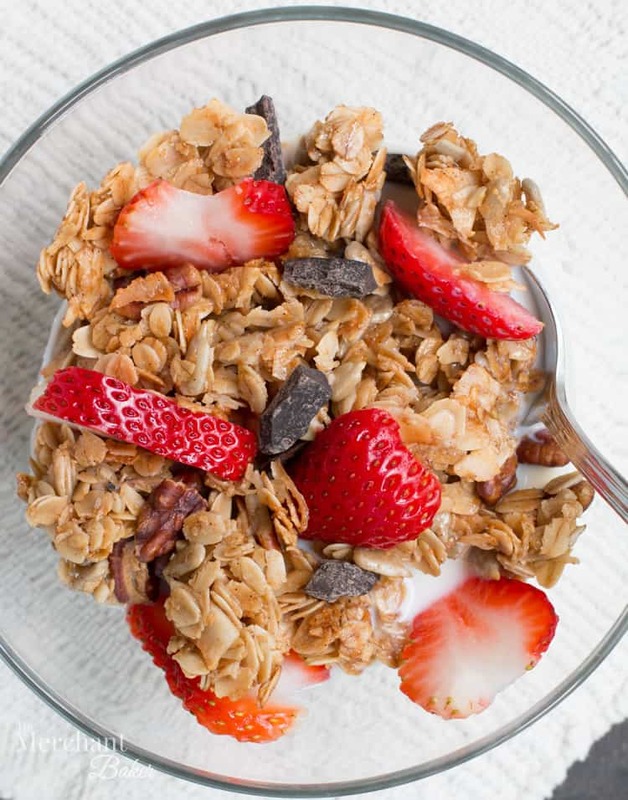 On top of that, those parfaits are full of protein and calcium from yogurt, full of protein and healthy fats from the nuts, and full of hearty fiber from the oats. Any vitamins you get from the fresh fruit just add to the benefits. The chocolate? Well, what can I say? There’s some benefit to dark chocolate too, isn’t there? Oh, and fruit and chocolate make a perfect marriage. That’s a flavor benefit. I’ll leave it at that. The best part of it all? 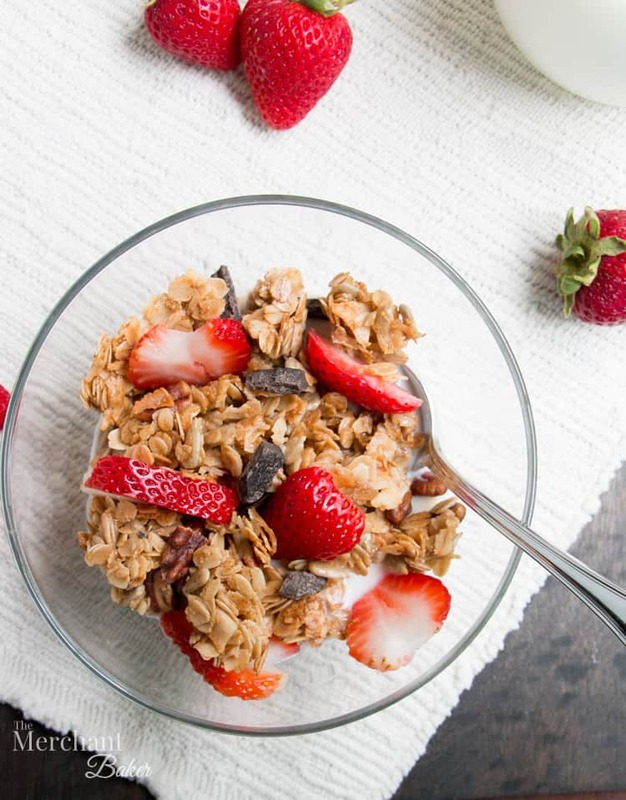 A granola/yogurt parfait keeps everyone satisfied until lunch time. That works for me. 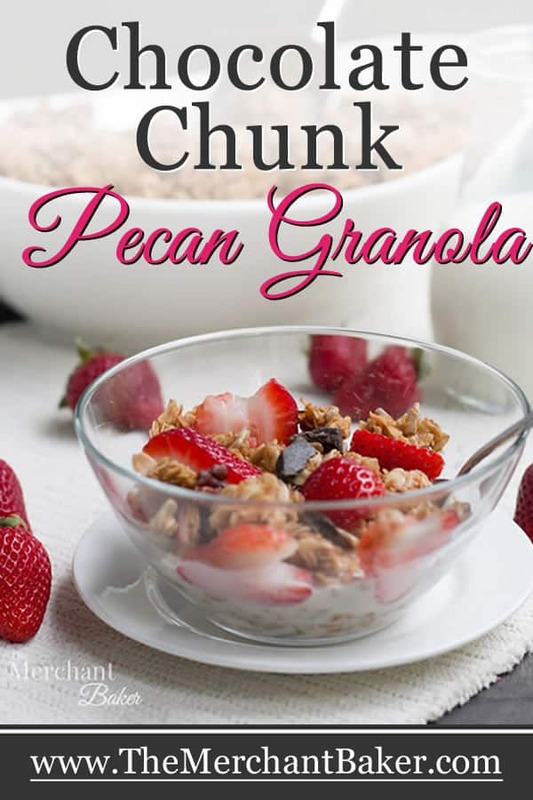 Alright…enough about cookies and pecans and granola parfaits. 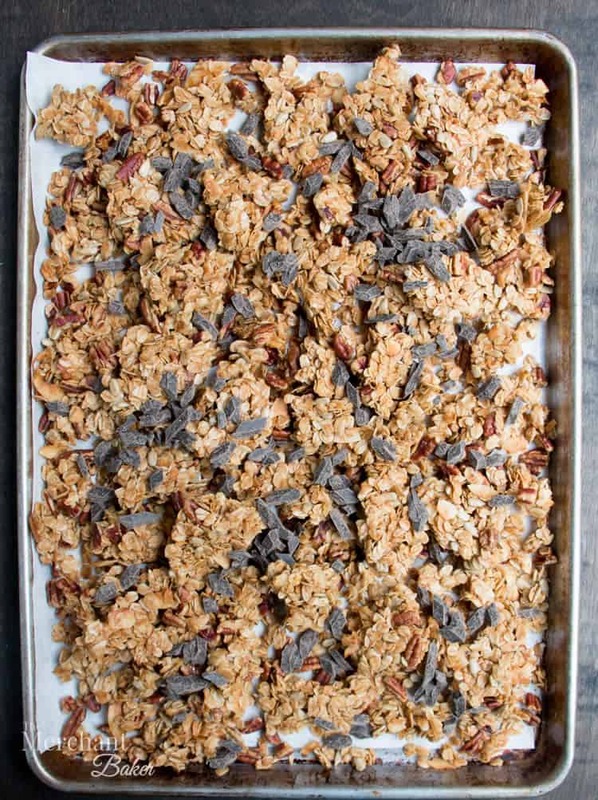 Let’s get back to the granola itself. BUT, my sister, ever the practical soul, saved the bag that it came in and gave it to me as a reminder of its ingredients…you know, in case I ever decided to make a batch myself. Which brings me to today. Yep. I made a batch myself. And ,just like every single time I make cheesecake…I thought, this is soooo easy! I don’t know why I don’t make cheesecake more often! And so it goes with granola. It’s just ridiculously fast and easy. 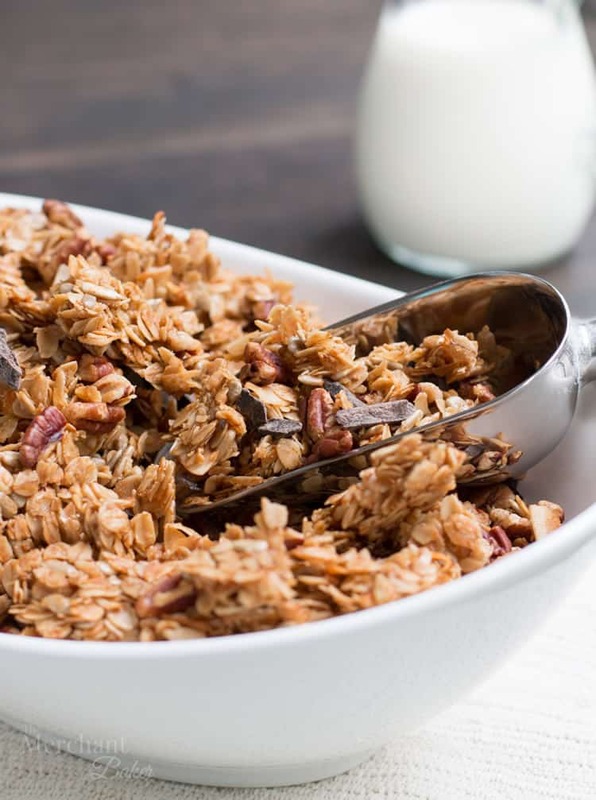 This particular granola is pretty simple. I started with the general road map of the ingredients I wanted to use from the bag my sister gave me. 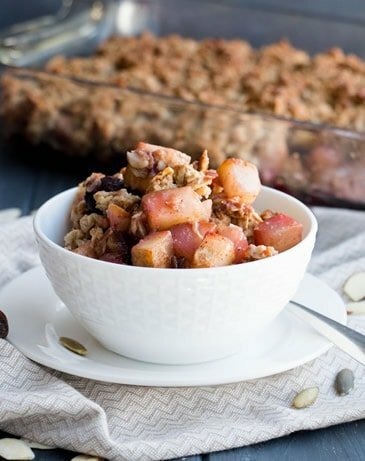 As with many granola recipes, the base of this one is good old fashioned rolled oats. 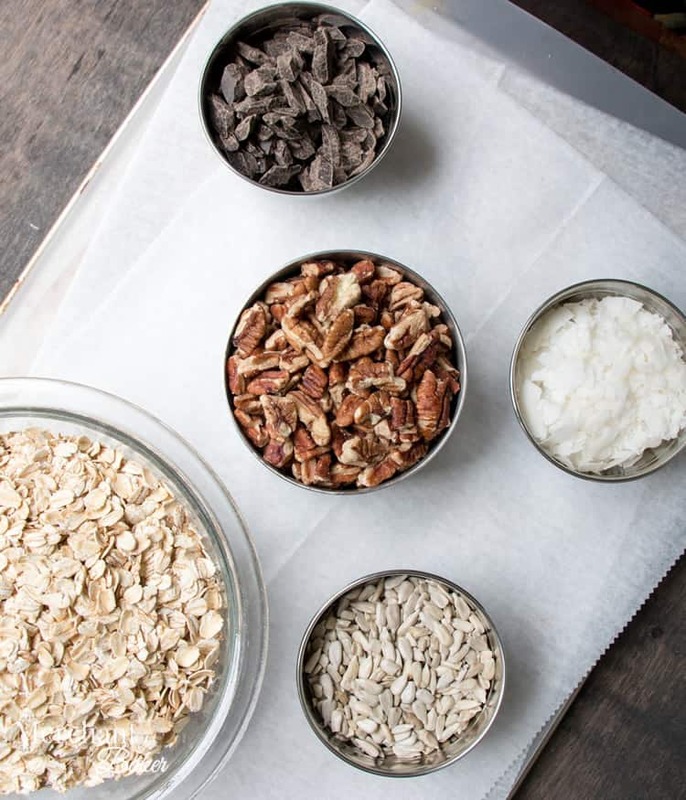 Don’t be tempted to use instant oats or quick oats. Go for rolled. 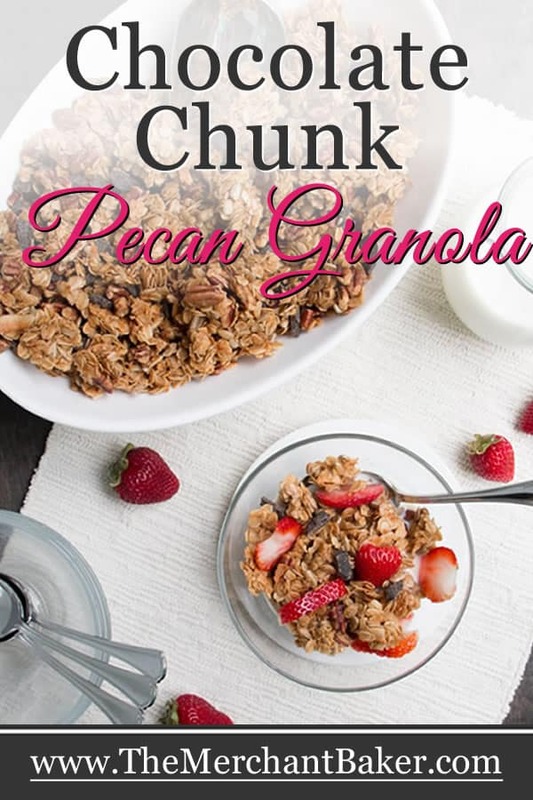 They will maintain the hearty texture we look for in a crunchy granola. Then, of course, the pecans are a main ingredient. I bought raw pecans. They’re going to get toasted in the oven, so no need to buy them toasted already. From there, I added sunflower seeds and coconut. 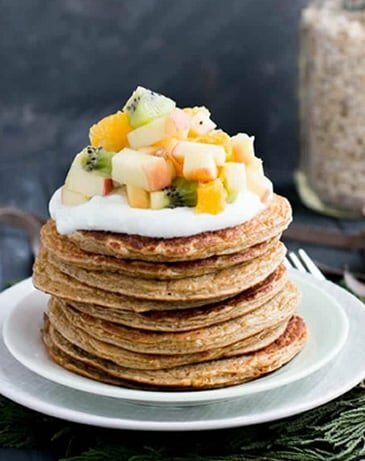 I used big, fat unsweetened coconut flakes. The coconut is a lovely addition. But, don’t worry. It doesn’t take over the flavor at all. 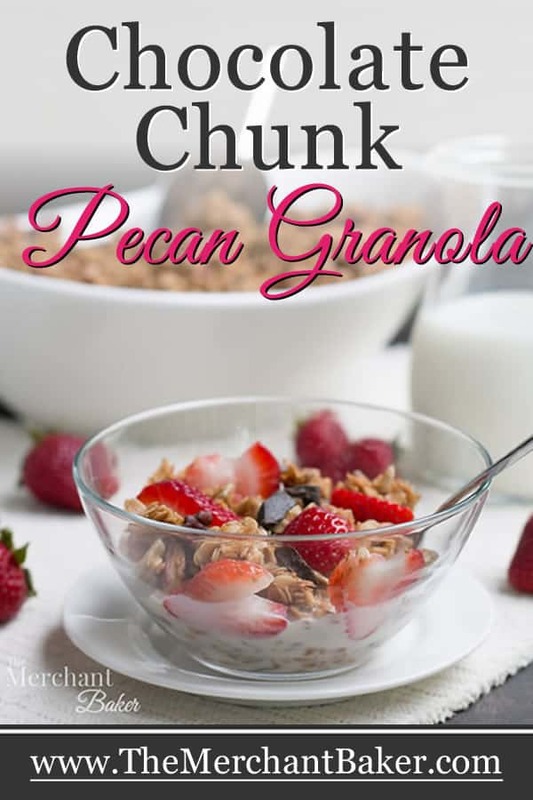 The oats, chocolate and pecans maintain their star status throughout. For spice, I simply added cinnamon. I didn’t add a ton of cinnamon, however. I didn’t want it to be the first flavor you tasted. Don’t get me wrong, I love, love, love cinnamon! Much of the time, I’m in the more is better camp with cinnamon. 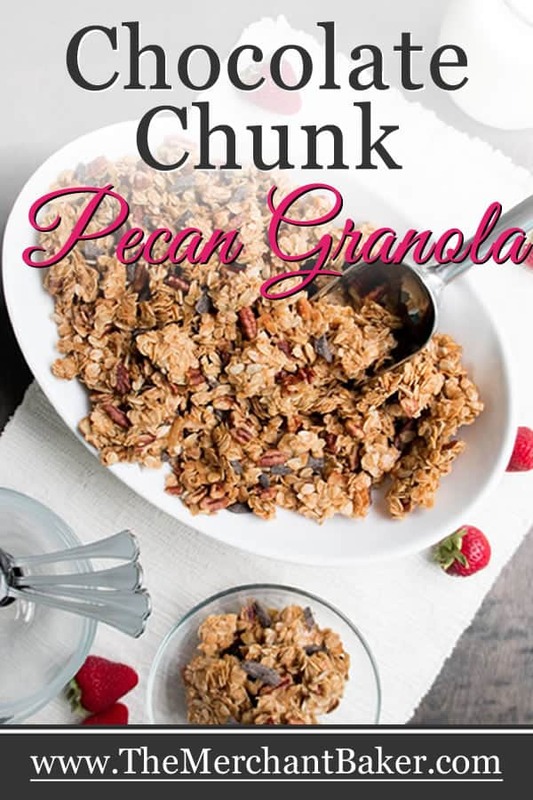 And if I were going for a brown sugar cinnamon type granola, I would have added more. But, over the years, one thing I’ve learned about cinnamon, is that sometimes a little restraint pays off nicely. 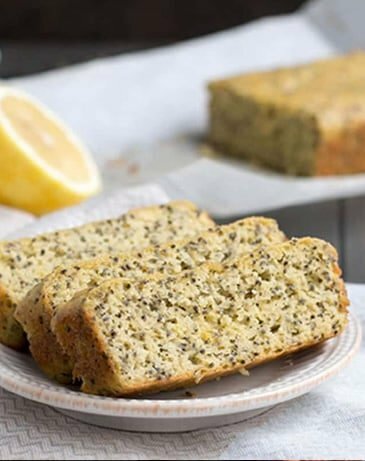 I often add it to muffins and quick breads in small amounts. 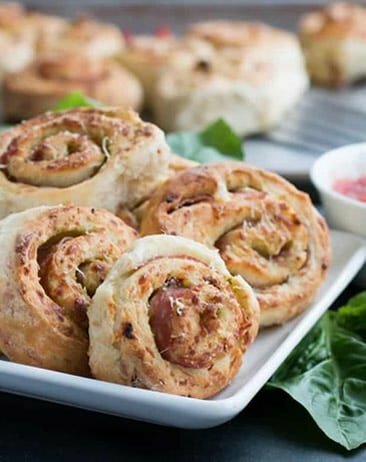 It sits there as a layer of flavor in the back ground and just enhances the overall flavor. I do that wherever cinnamon is not in the star role of a dish. Today, it plays a supporting role to the chocolate and pecans. 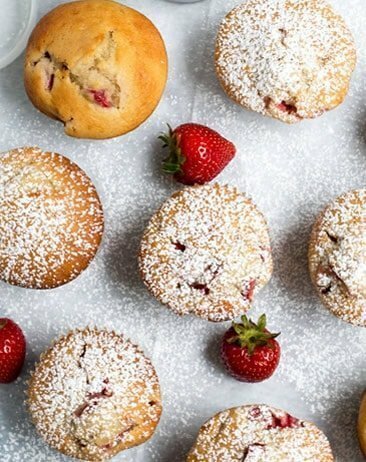 Of course, sometimes I want to make sure it’s a dominant flavor, like in these muffins, this cake or these rolls. Anyway, when he made this particular batch, he used kosher salt instead of our regular table salt. He didn’t realize that when you use kosher salt, it does not substitute 1:1 with the same measurement as table salt. This is because kosher salt has bigger granules. So, there’s all that space in between the granules leaving empty the space that the smaller granules in table salt fill in. Basically, you get more salt in one teaspoon of table salt than you do in one teaspoon of kosher salt. That’s why I specify in my recipes when I use kosher salt. My husband didn’t realize that and just used the kosher salt as if it were table salt. But, the cookies tasted off. I didn’t realize what had happened at first. Were my taste buds off? Why did one of our favorite cookies not taste right to me? Then, I figured it out. I sprinkled some salt on top and, lo and behold, they tasted like they were supposed to. Salt plays such a huge role in taste in general. 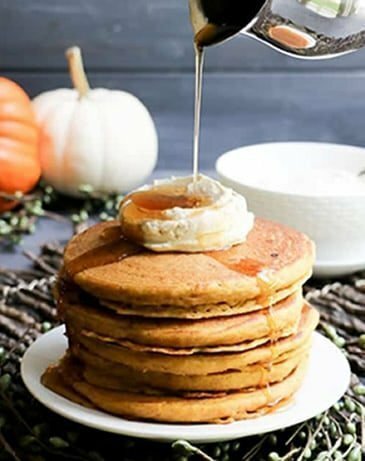 Here, it serves to balance the sweet. So, that’s it for the dry ingredients. Onto the wet ingredients! So, you’ll see in the recipe that olive oil provides the majority of the fat needed. Then, I add a shot of butter for flavor. I used salted butter for mine. I approached the sweetener the same way. 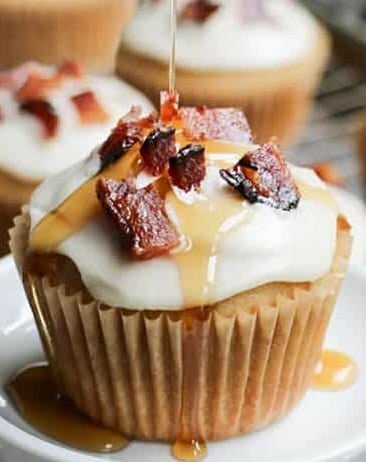 I knew I wanted to use honey for my sweetener, but I also wanted a shot of brown sugar for it’s caramelly molasses flavor. Finally, I added vanilla. After all, vanilla is key in my chocolate chip cookies. I considered, multiple times, whether or not I wanted to add an egg white to the wet ingredients. 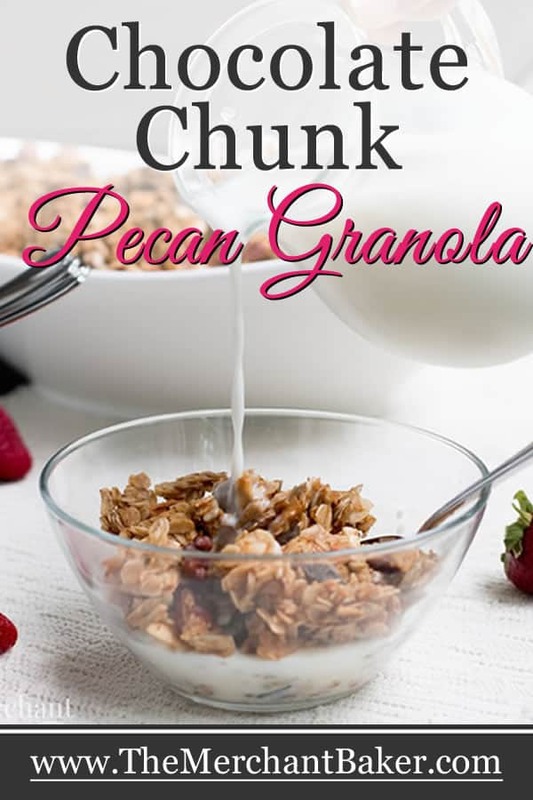 Adding an egg white would help bind the granola together for more sturdy chunks. But, I really wanted to see how just the oils and sugars would fare without the egg white, so I went without. Alrighty then…as I said in the beginning, it’s pretty much a mix and bake deal. Mix your dry ingredients in one bowl. Your wet ingredients in another. Then, just thoroughly combine them, making sure all the dry ingredients are evenly coated with the wet. I used a parchment lined baking sheet and firmly patted the mixture in a nice, even layer on the pan. Compressing the mixture tightly helps create the chunks we want after baking. I baked it until it was golden brown and then removed it from the oven. While it’s baking, you do have to stir it twice and pat it back down again. But, really, it’s not a big deal. Once it was cool, I gently broke it up into pieces. You’ll see that even without the egg white, I still ended up with some nice chunks. They are more fragile chunks, to be sure, but they are chunks. 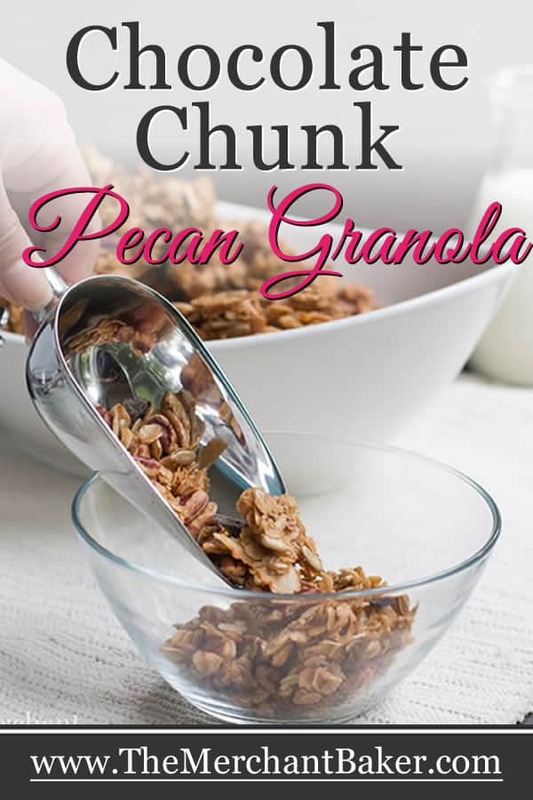 I like to think of them as the kind of chunks that will refrain from challenging your teeth. I liked how the texture turned out. Finally, I added some dark chocolate chunks. Ah, yes…the pièce de résistance! You don’t have to go crazy here. I think a little chocolate, at least in this application, goes a long way. Actually, it looks like a lot to me. 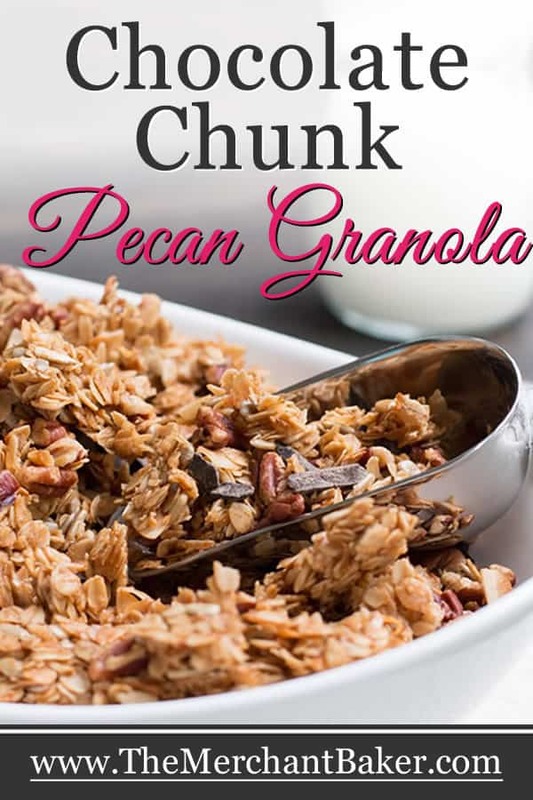 I chose chunks instead of chips for their rustic good looks. 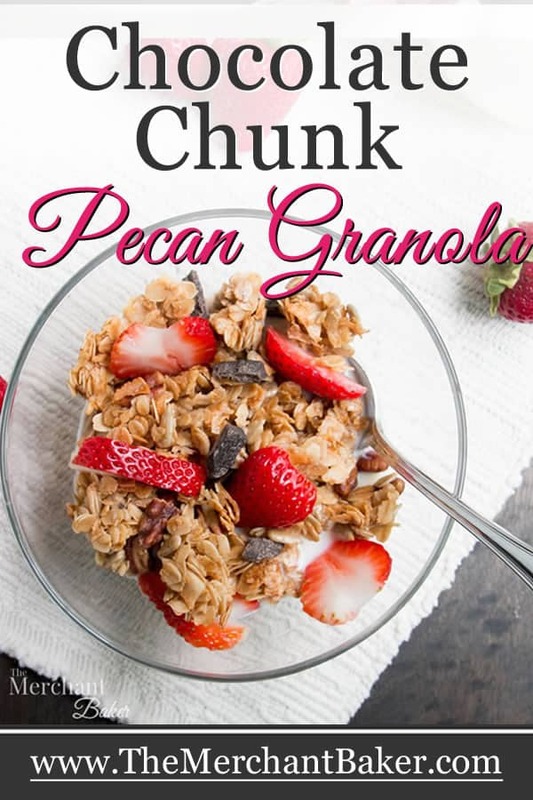 They’re quite a good match for the chunky granola. 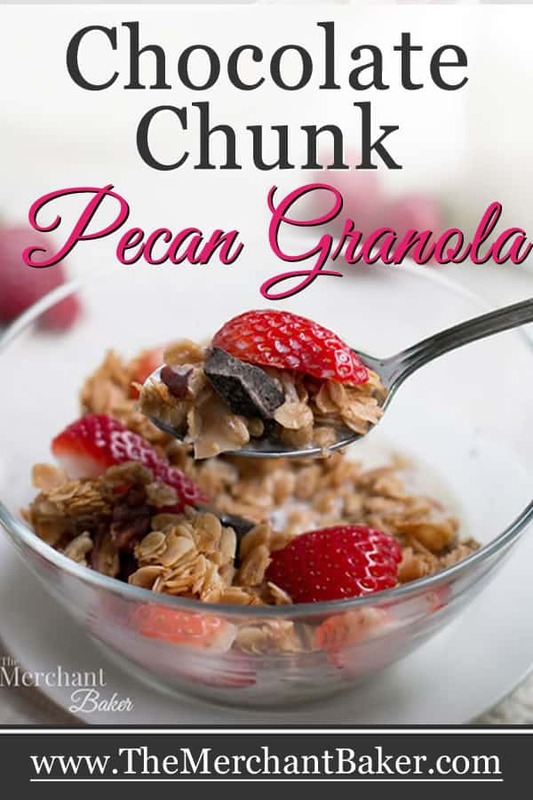 So, the big question….Did it taste like the granola I had on vacation? Well, I didn’t have a side by side comparison available, but it certainly seemed like it to me. We loved the simple combo of toasted pecans and chocolate. 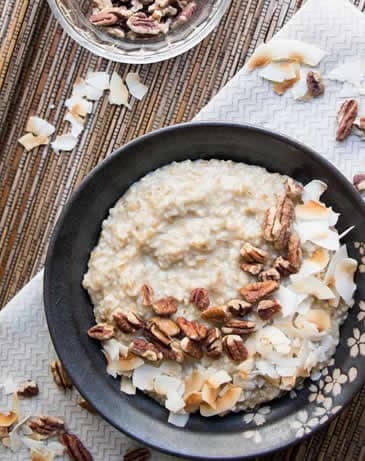 The coconut and seeds just added to the depth of flavor and interesting texture. 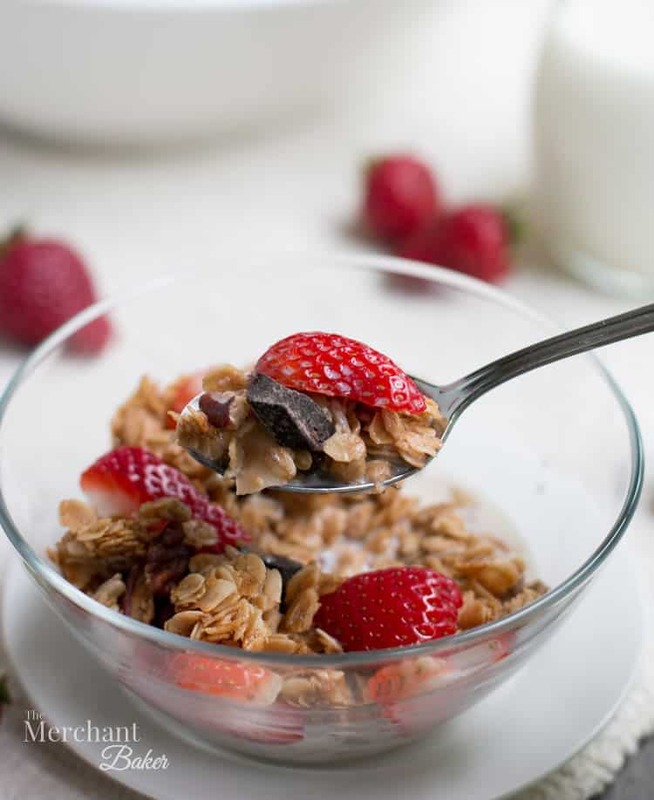 The chocolate is particularly yummy when paired with fresh berries, whether that’s in a yogurt parfait or in a bowl with some milk. That’s basically it. 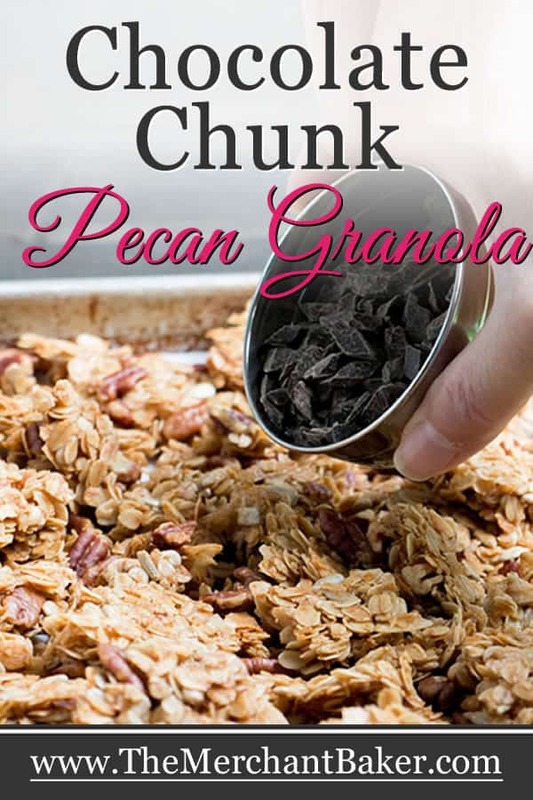 That’s how you make Chocolate Chunk Pecan Granola. I said it would be easy. 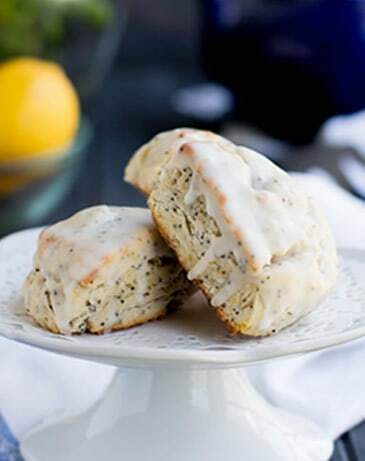 Just mix, bake, cool and break it into chunks. Or, break it into bits. Preheat oven to 325 degrees F. Line a half sheet pan (or large baking sheet) with parchment paper. Set aside. In a liquid measuring cup, combine all wet ingredients except vanilla. 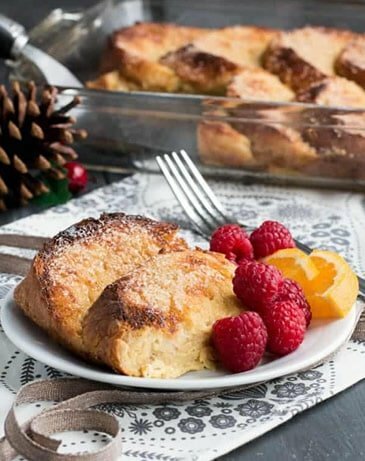 Heat in microwave until butter is melted and brown sugar is incorporated. Stir in vanilla. Pour over dry ingredients and stir well to insure all parts get coated. 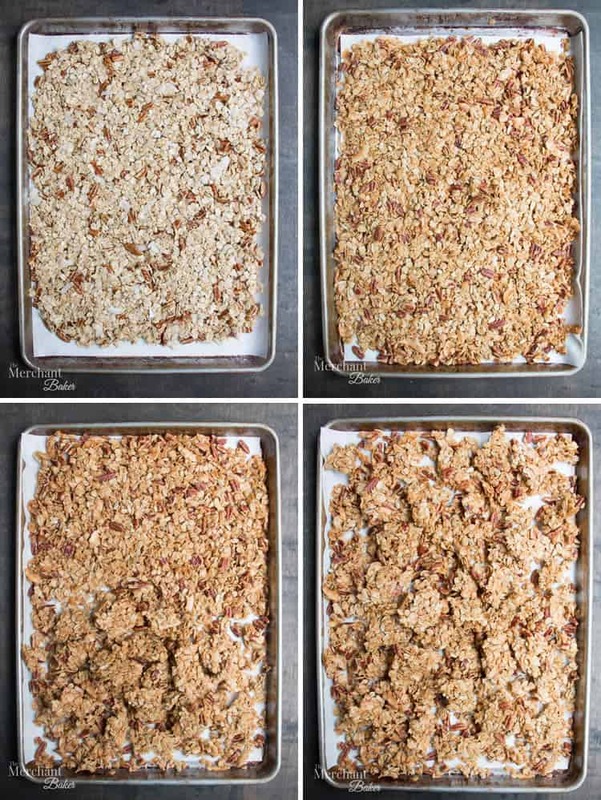 Spread the mixture evenly on the prepared baking sheet patting firmly down with the back of a spatula to flatten. Bake for 15 minutes. Remove from oven. Stir and firmly pat back down into an even layer. Bake for another 15 minutes. Stir and pat back down. Return to oven and bake for another 5-10 minutes or until golden brown, being careful not to over bake or you'll burn the nuts and coconut. Remove from oven and allow to completely cool on baking sheet. Break into pieces. Add chocolate chunks. Store in an airtight container at room temperature for a couple of weeks. For longer storage, I seal mine in a zip top freezer bag and store in the freezer for up to 3 months. 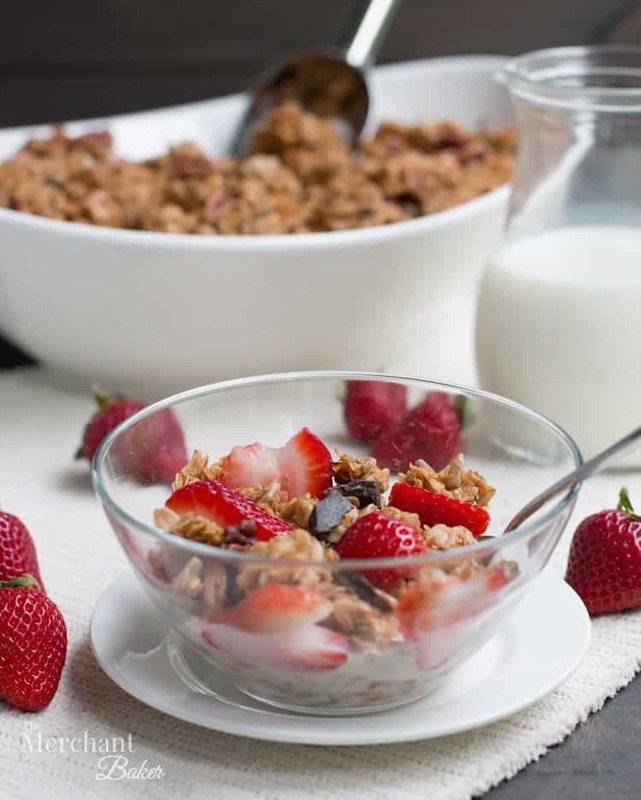 *If you prefer a sweeter granola, increase sweeteners (honey/brown sugar) to 1/2 cup total. For example, 1/2 cup of only honey, 1/2 cup of only brown sugar, 1/4 cup honey with 1/4 cup brown sugar etc. 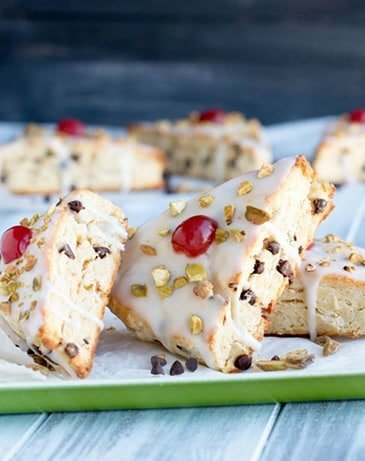 You could also use milk chocolate chunks to add some additional sweetness. 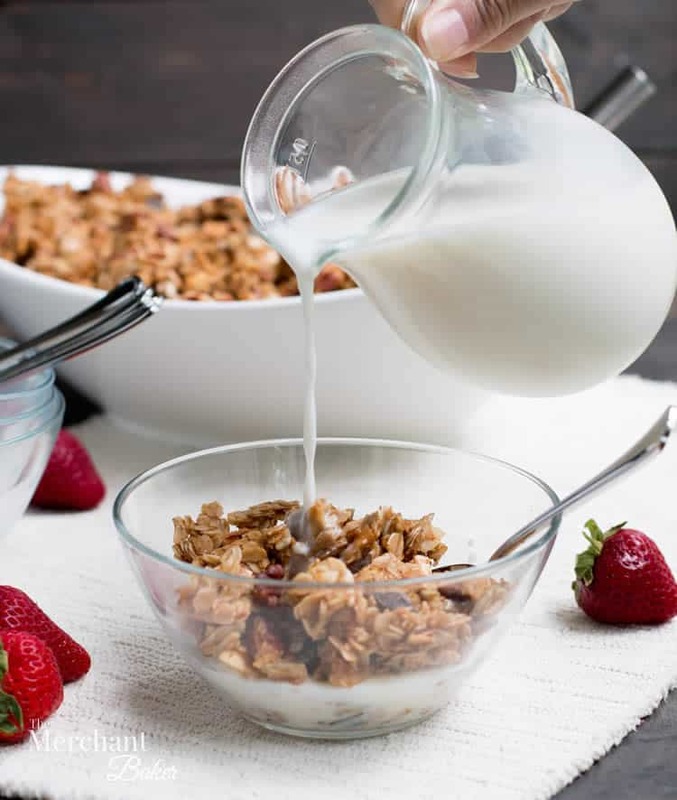 *If you don't want to use butter in your granola, simply substitute it with additional olive oil. *I like olive oil, but you can use your favorite oil such as canola, vegetable, sunflower, grapeseed or coconut. *I you're worried that your coconut will burn, add it half way through the baking process. Just stir it in at that first 15 minute mark. I like to add it at the beginning so that it get fully coated by the wet ingredients. Then, I'm just extra vigilant during the baking process.